Unless we're talking about Ray's Indoor Mountain Bike Park in Cleveland, I hate riding indoors. It feels wrong, but I'm often forced to do it anyway. This past miserable winter was made more so because of the snow, and I would, hamster-like, pedal on the rollers. I tried taking a spin class, but I was literally century-sore for days afterward. Plus, there was a bit of a Clockwork-orange vibe going on since we were forced to watch weird music videos while pedaling. Also: If I'm going to pedal that hard for that long, I'd like to end up somewhere different from where I had started. But then I wondered: could a bike, riding indoors, actually provide something useful to the world? Yes, I found a discarded trainer. Somebody out there was even more disenchanted with riding indoors than me. Save for the missing adjuster bolt to control the pressure of the roller against the bike tire (I easily replaced it) this trainer of unknown origin was complete. Though it featured a way to adjust the resistance through a shifting cable one could mount on handlebars, I cut that part off immediately as I dismantled the housing. I ended up with a metal plate that I thought would work for what I had planned. 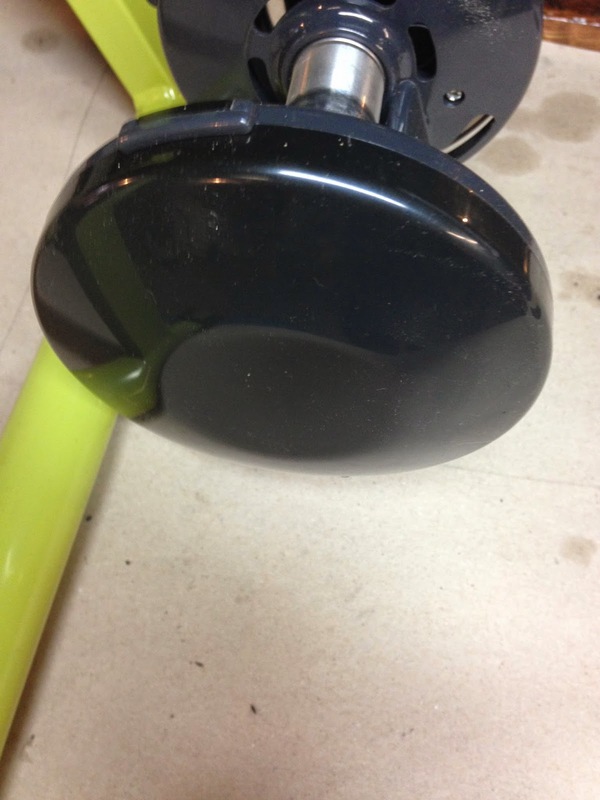 First, I went into my stockpile of old electric scooter parts (you mean you don't have one?) 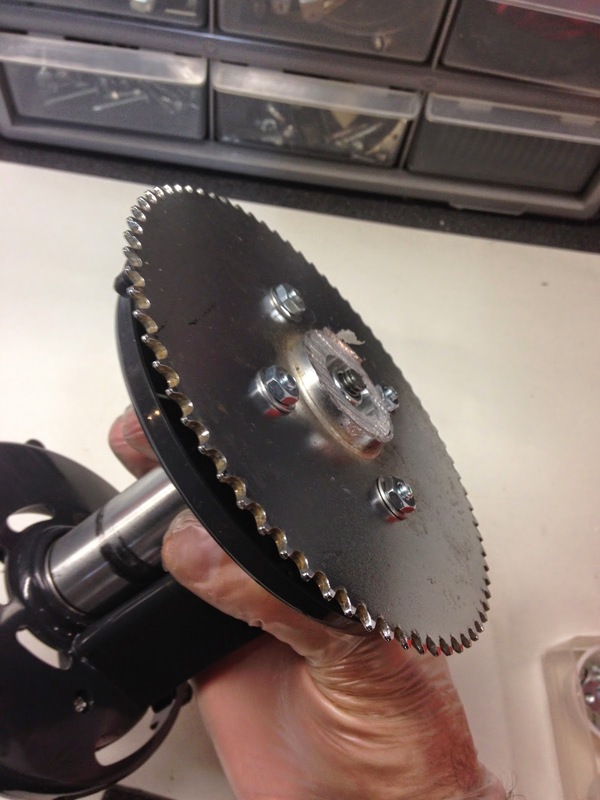 and was able to find the driving sprocket of one I vaguely remember spending $5 on at a tag sale 6+ years ago. Very carefully, I used a hacksaw to remove the wheel. When I was done with the cutting, I ended up this. 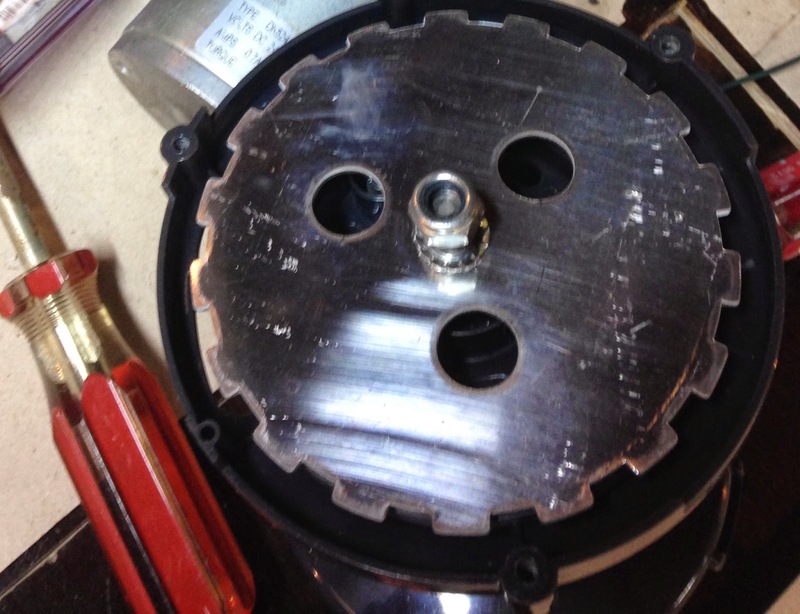 I removed the metal plate from the trainer, dropped the sprocket evenly over it, and marked the four holes (visible in the above photo) with a Sharpie. Surprisingly enough, the result was exactly what I wanted. 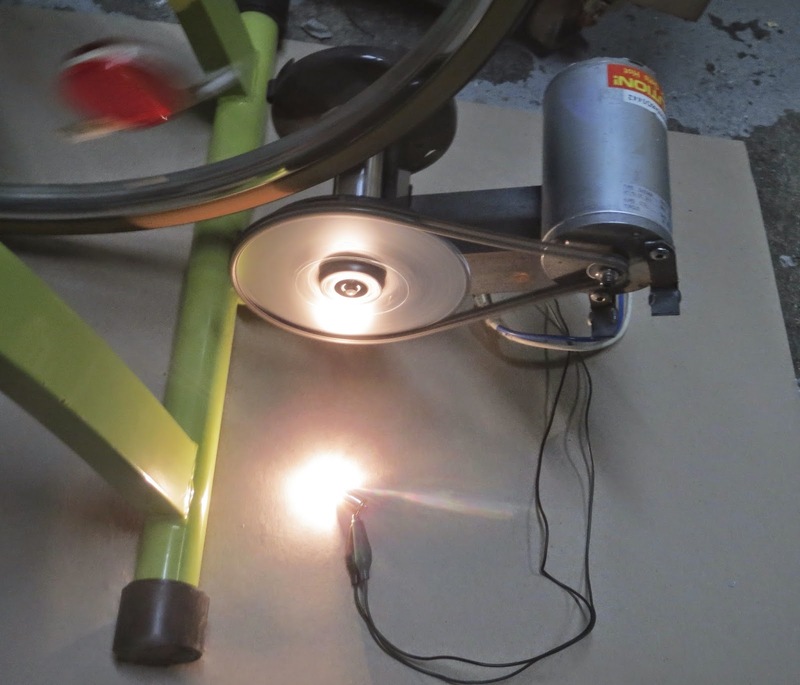 Next came the tricky part: With the roller housing off the trainer frame, I put the whole works on a clamp and dropped on the chain and the 24V electric motor. 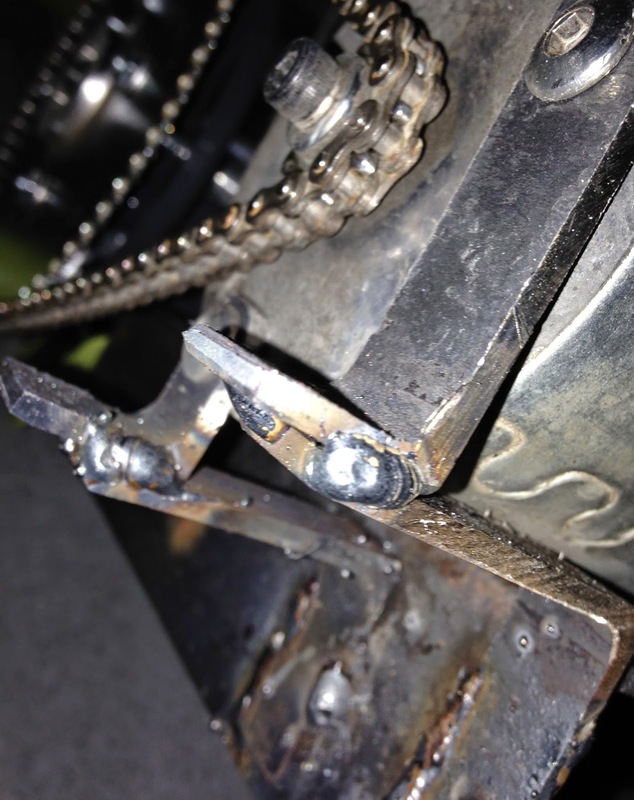 It took a while to decide how I was going to fasten the two together and knew I had to be especially careful when welding: the chain couldn't have too much slack or be out of alignment in any way. I took the bits from one L-shaped piece of steel and cut them just so. Once I was confident everything was aligned properly, I fired up my Lincoln Electric welder and let some sparks fly. 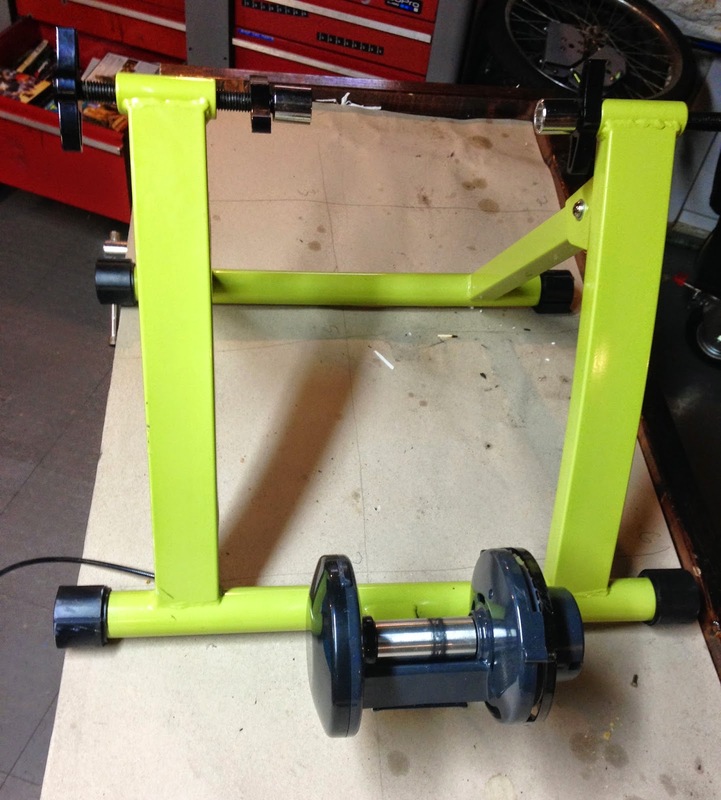 Eventually, I had my result: a motor and the back of the trainer mounted on a solid piece of steel. Next, it was time for the moment of truth: I reattached the entire assembly to the back of the trainer frame and put on a bike. 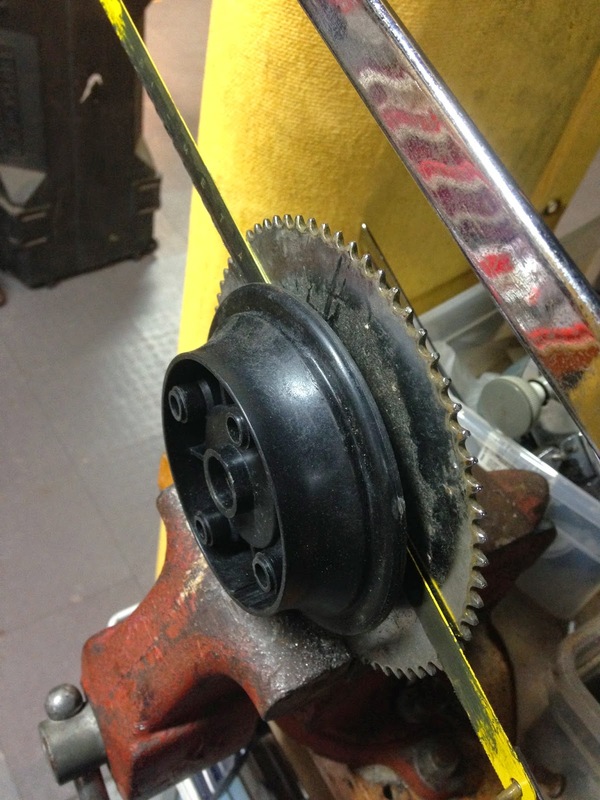 I attached something to the end of the scooter motor's wires so I could see if anything would happen when I started pedaling. I remember as a kid going to a science fair once and I saw two electric motors: one had a light bulb on it while the other had batteries. 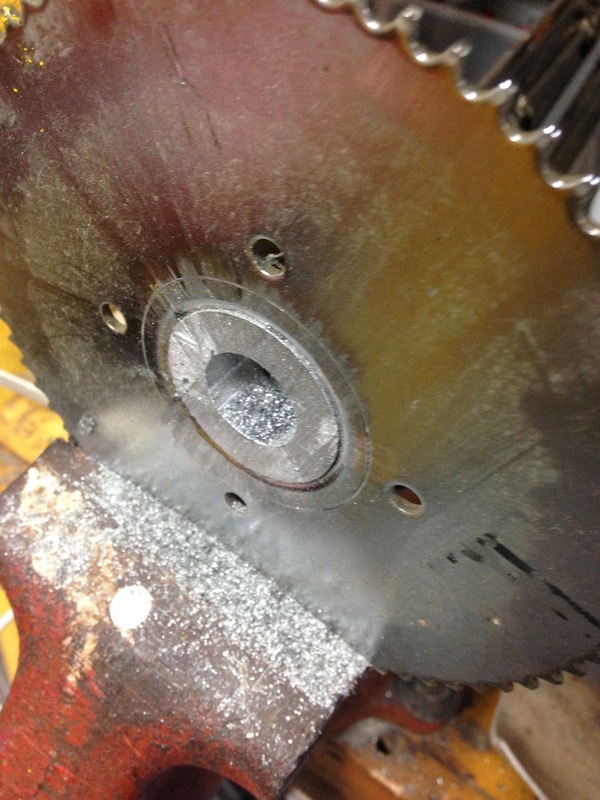 When the motor's gears were touching, the battery-powered motor spun the other and the bulb went on - just like mine did. It was nice to know I remembered that. In the mid 1980s, most of my brain was reserved to memorizing the plot lines of every 'Transformers' episode. Glad something useful made the cut (but the episode where Optimus Prime has to outwit a big game hunter was pretty awesome). But anyway: I have electricity coming out of the contraption, but I'm not sure how much (it's enough to burn out the light bulb in the previous photo) or what I'm going to do with it. The voltage tester I have in my shop was built before the discovery of Radio Shack, and if I want to do something like build a way to charge cell phones while pedaling I'll have to, you know, learn how to do it. I'll also appreciate any suggestions on what to do with my newfound power. Thanks for reading and thanks for riding.